Need More Storage Space in Your Home? Tired of Paying Storage Unit Fees Month After Month? Want to Actually Park Your Car in the Garage? A Garage Attic is the second floor you need in your Raleigh, NC garage because if you're like most people you probably have more stuff than you can neatly store away in your home. Seasonal items, tools, keepsakes, sporting equipment, and that enormous pack of paper towels you bought at the wholesale club all have to be stored somewhere until needed. 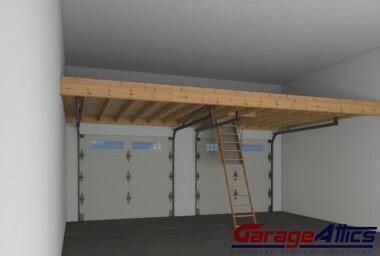 Our overhead garage storage solution makes use of the wasted space your garage already has above the door tracks. Our garage storage loft solutions are design to convert your garage into a dual purpose parking and storage area giving you the best of both worlds without reducing any of your floor space. 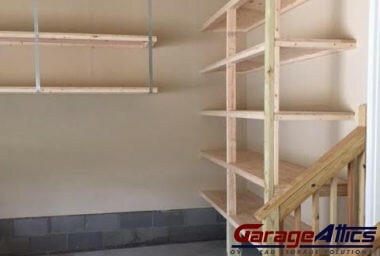 If you’re in need of storage space above and beyond what our storage loft solutions provide, we also offer garage shelving services to fully maximize your storage capacity. Check out the links below to view some of our projects. Address : 104 Virginia Water Dr.